I have nothing to say but great things! Affordable, efficient and the customer service is top-notch. If I had any questions, Alyssa responded instantaneously. Great company and highly recommend as the value is amazing. Very kind and responsive team, easy process of trying on and returning anything that doesn't fit. We brides have enough on our plates and let me tell you first hand, worrying about wedding suits for men was starting to haunt me. We wanted a blue suit and heard about the daunting ‘return your rented suit the next day’ policy suit rental outfits have in place. And then we heard about The Groomsmen Suit – where you can OWN your suit for the same amount of money for a crappy, smelly ‘return the next day’ rental. And let me tell you, we made the right choice with TGS – all of our guys looked so incredibly handsome! 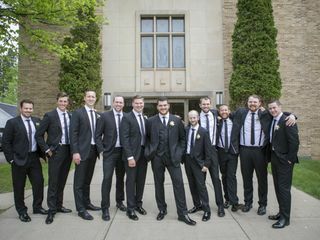 Having TGS on hand to help facilitate a procrastinating groom, multiple out of state groomsmen, 3 fathers who wanted a tuxedo and a couple of kid brothers, look their absolute best, put my groomsmen worry at ease. The process is incredibly simple and easy for all men or all ages to understand! I also need to add that my fashion forward knit picky groom absolutely loved his Italian made suit and my traveling musician brother has noted how well the suit travels in the back of the van! We loved working with The Groomsmen Suit and would pick them 100 times over to dress our guys and our dads again. Thank you, TGS! Great suit and awesome company to partner with! The Groomsman Suit team was super helpful and responsive! The suits were great quality and reasonably priced. Would 200% recommend to anyone looking into suits for their big day! I just got married this past weekend and Groomsman Suit played a major role in it by making sure my groomsman and I looked great. Alyssa was very helpful in ensuring that our order was expedited and would arrive in time incase there were any last minute changes that needed to happen. We ordered the brilliant blue jacket/pants and the fit and feel where great. I would say the quality was an 8/10 when compared to some higher end suits. This was a much better experience than going to a suit rental store. The groom and groomsmen got their suits from The Groomsman Suit, and they turned out perfectly for our big day! The suits were a beautiful navy and fit the guys perfectly, all for a very reasonable price. 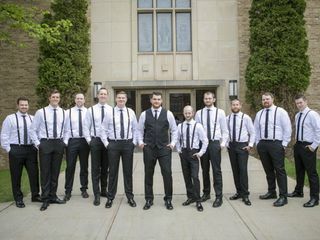 I would recommend The Groomsmen Suit to anyone looking for a good suit for their big day! I had the absolute pleasure of working with Diana and Jeanne while getting suited up for my wedding this past summer. It was the best and easiest experience I have ever had while acquiring formal attire. It was also simple and painless process for all my groomsman! Top quality products and top notch service all around! 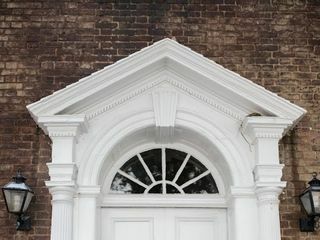 They were easy to work with, very affordable compared to most places, and they looked incredible! We made the mistake of using a custom suit company other than The Groomsman Suit - however with 2 weeks to spare we were still missing 3 suits...I called The Groomsman Suit and explained our situation - Diana, and her team were not only quick to come up with a solution - but also so kind to a stressed out bride (I was in full panic mode). The team expedited sample swatches to see if they would match the other suits and guaranteed to have suits in our possession before the wedding. Not only did they help us out at the last minute, but the customer service team reached out a few days after to check in to see if they could help in any other way. I can't give enough praise for The Groomsman Suit and would HIGHLY recommend!! The quality of the fabric was excellent, the price point is affordable, and most importantly the way they treat their customers is beyond expectations. Thank you again to the entire team!! We were looking for a company to buy suits for the wedding party. The Groomsman's Suit was amazing. They were very flexible and offer a great suit at a great price. I emailed back and forth about 50 times with the customer service people (Thank you, Katie!) and they were always pleasant (even when I was not). The first suit we ordered was a rayon blend which we hated and promptly sent back, but when I explained why we didn't like it they suggested their premium wool suits which weren't even offered on the website yet. We tried the Premium Navy Suit in a few sizes until we nailed the prefect one for my husband. It is a great Italian wool suit for less than the price of renting a tux/suit at Men's Warehouse! (We looked into ALL options). We also got my husband's shoes here - they are a brand he already wears and getting a new pair here was cheaper and easier than going out and trying to hunt down a pair in the right color. Once we decided on the suit we just gave the Customer Service team (Katie) the emails of the groomsmen and she took care of the rest. They all looked awesome on the wedding day and now they have a nice navy suit they can wear again and again! Would recommend highly - especially the Premium Navy suits. May even buy more in different colors! We loved The Groomsman Suit! As a bride, this made it so simple for me to make sure the groom and groomsmen would be dressed and ready to go! My husband loved picking out the options for the guys, and we had tons of great feedback from the groomsmen on how easy the process was. Highly recommend! So much better than renting a suit! Our Groomsmen got to keep an amazing suit at a similar cost to renting. My now husband & I can't say enough about TGS!! 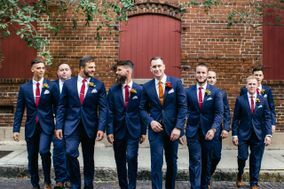 We spent so much time searching for quality, affordable, and stylish suits for our groomsmen and were finally at our last resort and thinking about renting. Up popped TGS and they answered our prayers!!!! From the quick responses, sending samples back & forth, and working with me & my bridal party all the way in BELIZE, the customer service is exceptional to say the least. Honestly, it's a model for other companies to follow!! Now, on to the actual suits - WOW! They looked good on every body type and are a great quality!! I'm also so happy that my guys get to keep these suits and were them for other occasions. THANKS TGS! 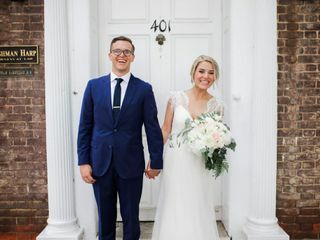 The Groomsman Suit is an incredibly accommodating company that works so hard to make sure that you have the right fit for your suit and will do whatever they can to get your suit fitted with plenty of time to spare! I would absolutely recommend them to anyone! What an excellent company! My wife and I got married recently and during the planning, I was really interested in pursuing a suiting company who allowed groomsmen to keep their suits. This initially led me to the morally and likely literally bankrupt company Combatant Gentlemen. However, right as our wedding was approaching more and more news surfaced about CG failing to deliver wedding orders on time. With only a month before our big day, I decided we needed to make a change. That change was The Groomsman Suit. The Groomsman Suit called me to discuss what I had in mind and within 3 days I had a suit delivered to my door. This first suit didn't fit so I returned it using their free return shipping. I emailed my measurements to TGS and based on that, Diana gave me jacket/pant recommendations which were then delivered in another 2-3 days and fit perfectly (minus the need for pant hemming). I had 2 high quality, handsome looking suits delivered to my door in a week's time. The wedding went perfectly, myself and my groomsmen looked sharp. 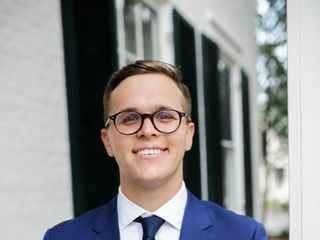 The Groomsman Suit saved us from a wedding nightmare and I couldn't recommend this company more highly. My experience with The Groomsman Suit was awesome from the start. There are so many parts of the wedding planning process that are a pain, but Jeanne and Diana made it easy. They helped getting all my dudes into suits without me having to worry. So, that's all great and all, but to top it off the suits were amazing. I wore the Navy Tux and got compliments all night. The groomsmen were in the Navy Suit and they looked all looked super sharp. We even got my dad and the father of the bride into suits, and I (or anyone else there, it seemed!) had no idea they could clean up so well. To top it all off, everyone was super stoked that they got to keep the suits, instead of paying MORE to rent them just for one event (as is the 'traditional' route). Would recommend—and have already done so—The Groomsman Suit to anyone planning or wedding... or just in need of a great suit. The Groomsman Suit was wonderful to work with! My sons pants were too big and they sent the smaller size right away before receiveing the returned bigger size. Got back with us right away on any questions, friendly and high quality products. I have recommend them to many people. Thank you, we appreciate you making all the young men look great! They were extremely helpful with confirming the right fits and the right sizes for every single groomsmen. I have them the measurements and height/weight and they cross referenced to make sure I was buying the best fit. Extremely friendly, helpful and responsive and a fantastic suit for a fantastic price! I highly recommend them to anyone! I was skeptical about ordering online and thought that the hassle would be too much. 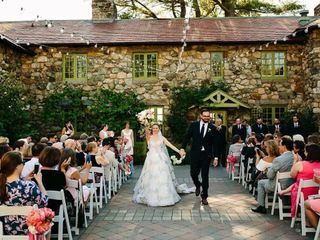 The team at The Groomsman Suit is exceptional and actually cares about you and your event. I worked with Jeanne on multiple questions and a return and she was responsive, caring, and thoughtful. She wanted it to be done right which was a nice change to a lot of online dealers. If I were to run a customer care organization I would hope to have a team like this! HIGHLY RECOMMENDED. 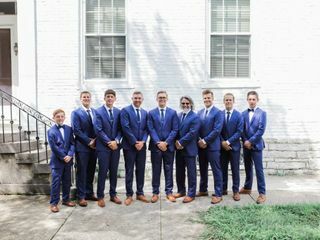 We decided to have our 7 groomsmen purchase navy blue suits and everyone had great things to say about the quality of the suit, the responsiveness of the team and the speed of which to make returns. I will certainly be purchasing suits/tuxedos from the groomsman suit in the future! Working with The Groomsman Suit was for my wedding was beyond great. ***Shout to Diana who was so helpful to me and my groomsmen. *** The quality of our suits exceeded our expectations tremendously. I can appreciate the concern for purchasing tuxedos via an online shop. However, I can say with full confidence that customers will not be disappointed when they shop with The Groomsman Suit. Cheers! I'm so glad I found this service. They took care of my all of my groomsman. They handled sizing and shipping with the guys. The suits looked great. Best of all everyone got to keep them. I've worn mine at a work even and another wedding. Can't say that about tux rentals!